At least 50 people have been killed in storms that have lashed parts of Spain, Portugal and France, officials say. Forty-five of the victims died in France, where many drowned or were hit by parts of buildings or falling trees. Winds of up to 140km/h (87mph) caused chaos as they moved from Portugal up through the Bay of Biscay. The storm system is moving north-eastwards and areas of France bordering Belgium and Germany are on alert for heavy rain and high winds. Worst affected have been the Vendee and Charente-Maritime regions on the western coast of France. 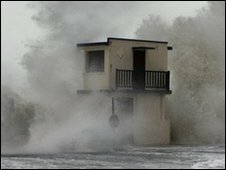 Huge waves and strong gusts battered many coastal towns, spreading floods inland and destroying buildings. 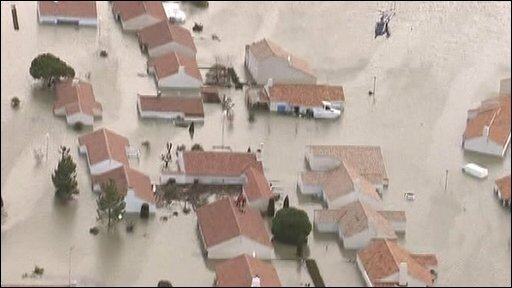 Residents took to their roofs in the Vendee region and police helicopters were in action attempting to locate and rescue them. At least a dozen people are said to be missing in France and 59 others injured. President Nicolas Sarkozy expressed his condolences to relatives of victims, and said that he would visit the stricken area on Monday. The French Prime Minister Francois Fillon said France would formally declare the storm a natural disaster, freeing up funds to help communities rebuild. He said that the priority now would be to make all the homeless people and those still threatened by rising waters safe. He added that flood prevention defences would be strengthened. "The government will, along with the local authorities, set up without delay a special plan to rebuild and strengthen the dykes, " he said. The storm system, named Xynthia, has put five of the 95 French departments on red alert - only the second such warning since a new emergency system was introduced in 2001. More than a million homes in France have lost electricity, from the Brittany peninsula in the west to the highlands of the Massif Central in the centre of the country. According to the AFP news agency, the French national power company EDF said half a million customers were still without power at nightfall on Sunday, and Mr Fillon said it would take several days to restore power everywhere. AFP reported that in Germany, a man was killed and his wife injured when a tree fell on their car in the Black Forest region. A female jogger in the western town of Bergheim, and a man in Belgium, were also killed by falling trees. Earlier on Sunday two Spanish men died when a tree crushed their car near Burgos. A Spanish woman was killed by a falling wall in Galicia, and a Portuguese boy was killed by a tree in Paredes. Rail services were severely affected in northern Spain and a number of trains in western France were delayed because of flooded tracks. Air France said 100 of its flights had been cancelled from Charles de Gaulle airport in Paris. Wind speeds hit 175km/h at the top of the Eiffel Tower, French radio reported. The French meteorological service said that shortly after 1700 local time (1600 GMT) the storm passed into Germany, Belgium and the Netherlands, and there were reports of high winds in the Swiss Alps. Spain's Canary Islands, particularly La Palma, Gran Canaria and Tenerife, were also hit by the storm, although there was no great damage.